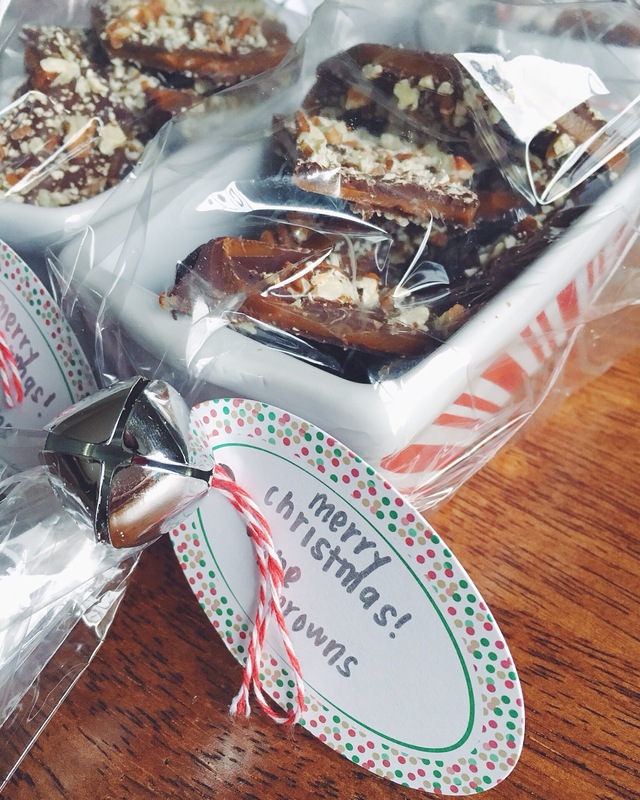 For as long as I can remember, my mom would make Pecan Brittle for Christmas. When I was younger I would watch her make it and help her sprinkle on the nuts, and as I got older she would let me stir the brittle on the stove or spread out the chocolate. 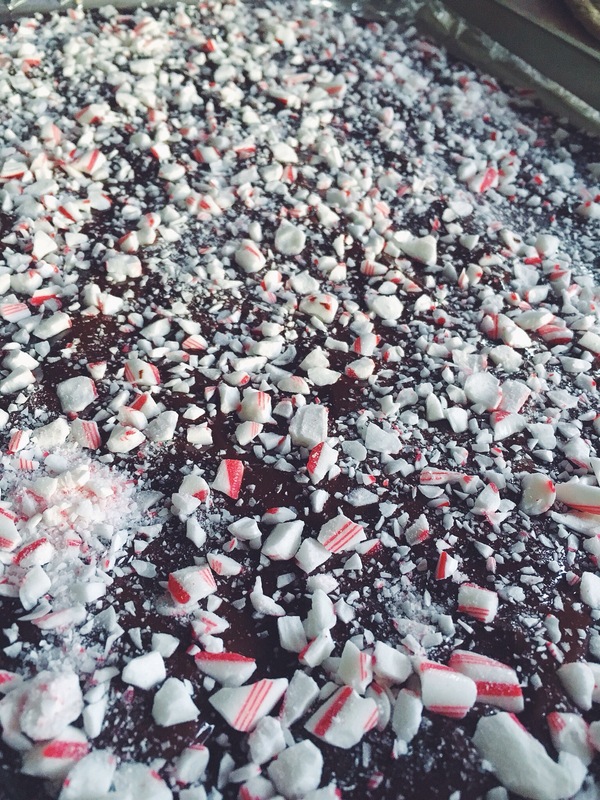 One year we decided it would be fun to mix it up and make a separate batch of Peppermint Brittle and it was equally delicious, and we have been making both ever since. We would wrap them up in cute gift bags and bring them to family, friends and co-workers. 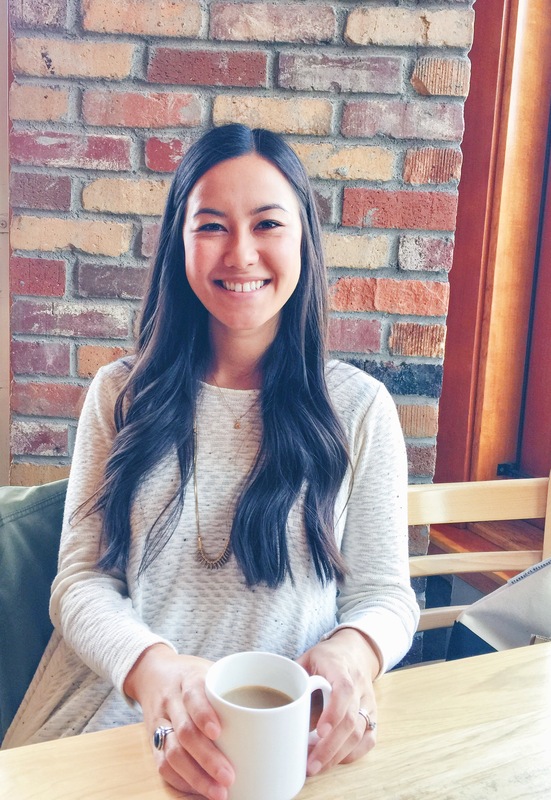 I love this tradition she and I share making the brittle, eating it (of course), and sharing it with others. It would get us in the holiday spirit and I hope it will do the same for you. 🙂 Now that I’m older and we live far away I wanted to keep the tradition alive. This was the second year I made it by myself and it definitely brought the Christmas spirit and nostalgia to our home. I was texting my mom pictures the whole time of how things were turning out, and if I have to say so myself they turned out perfect! 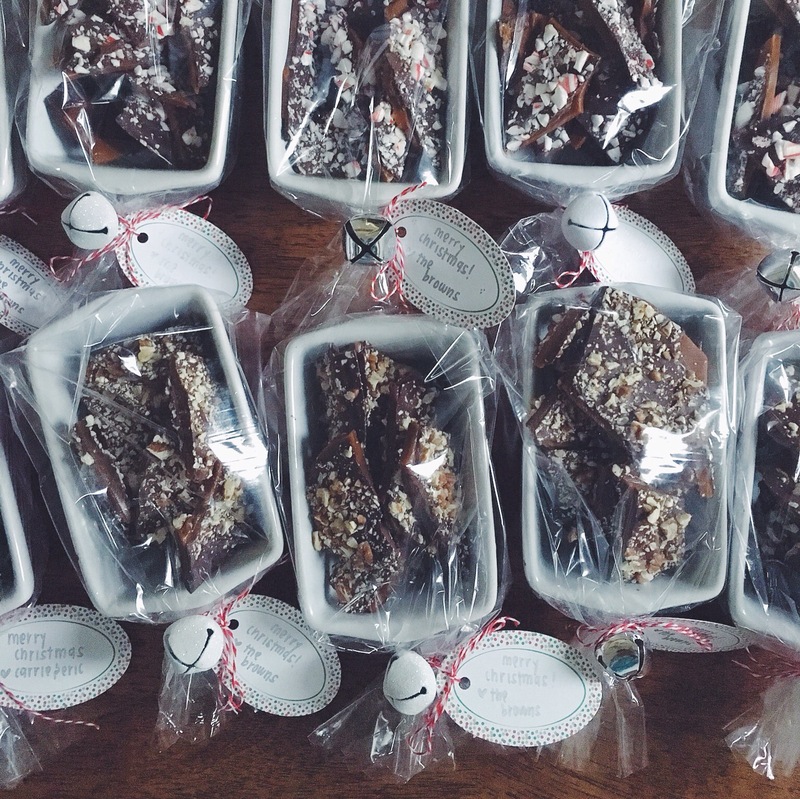 I can’t wait to share the brittle with loved ones to add to their holiday joy. It is a great feeling to give a gift made with love! Let the ingredients come together over medium heat. Melting, melting… and the boiling begins. Making a candy can seem intimidating but with a candy thermometer it comes along easily. 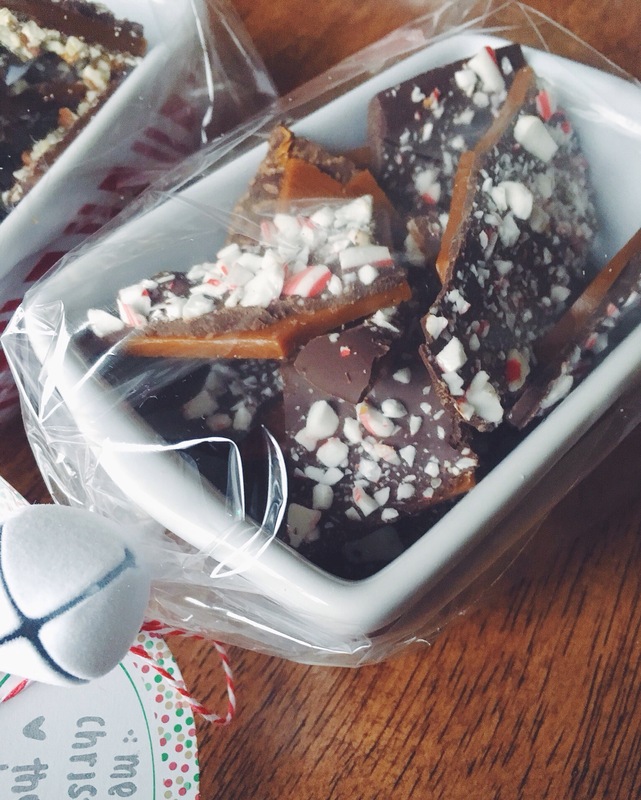 The most important tip for this brittle recipe is to watch the temperature closely as it reaches the hard crack temp., stir constantly as it gets hotter and removing it immediately from the heat once it reaches the desired temp so it doesn’t burn. Looking good, temp is still rising.. Just about there to 305 degrees F, when you will immediately pull it off the heat and stir in the vanilla. It’s a bit of a rush at this point to pull it from the heat, add the vanilla and spread it out. I have forgotten to add the vanilla before at this point because I am so worried about pouring it out quick enough so this time I left the vanilla in a bowl on the baking sheet so I wouldn’t forget to add it. 🙂 Spread it out thin and into as big of a rectangle as possible without seeing through it. Some people make their brittle and toffee thick, but we like it like this, a perfect crunch in the middle of chocolate goodness. Looks perfect! The shape doesn’t have to be spot on either because it’ll get covered and broken into pieces. 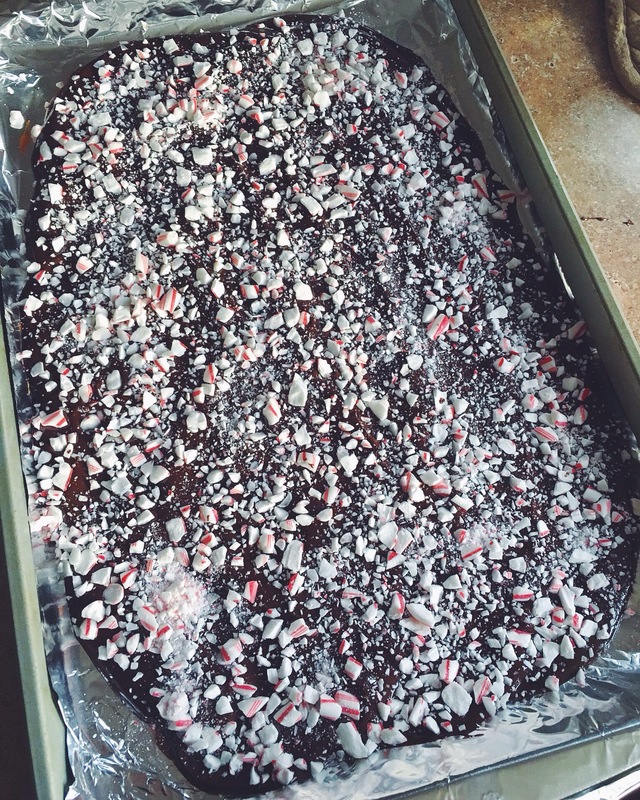 Once the brittle itself has cooled completely and hardened you’ll get started on the toppings. 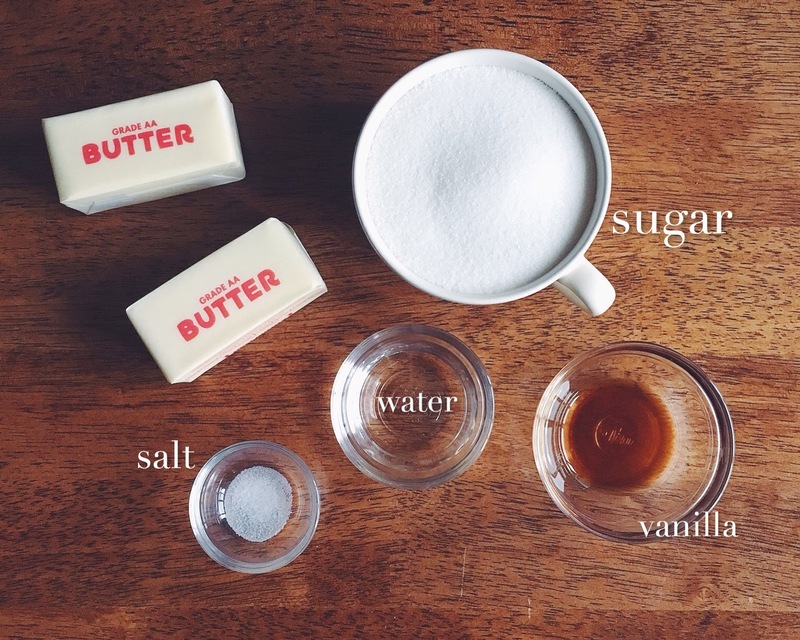 Here are the ingredients for the two different kinds, if you want to make both, you will need to double the brittle recipe and spread it out on two separate pans, if you’re making just one recipe then follow just one of the toppings below. 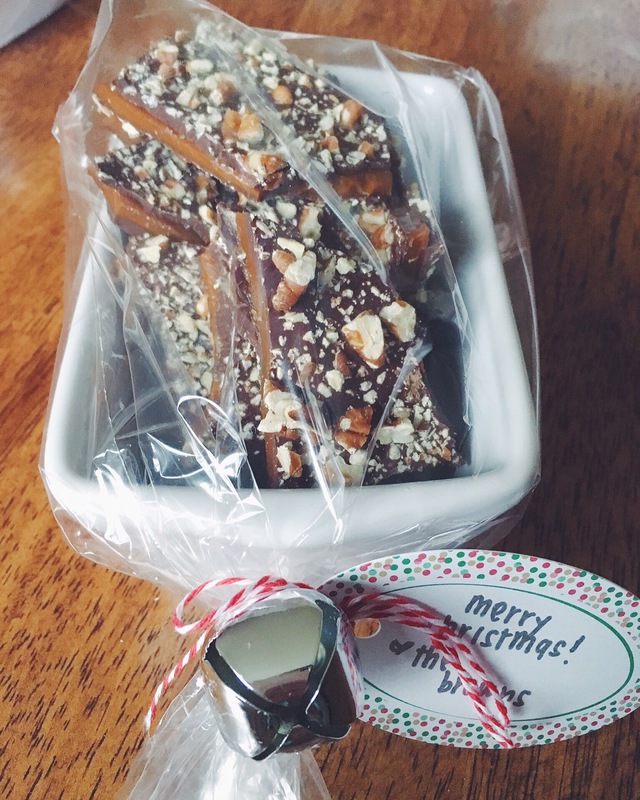 I used semi-sweet chocolate and candy canes for the Peppermint brittle and bittersweet chocolate and raw pecans for the Pecan brittle. 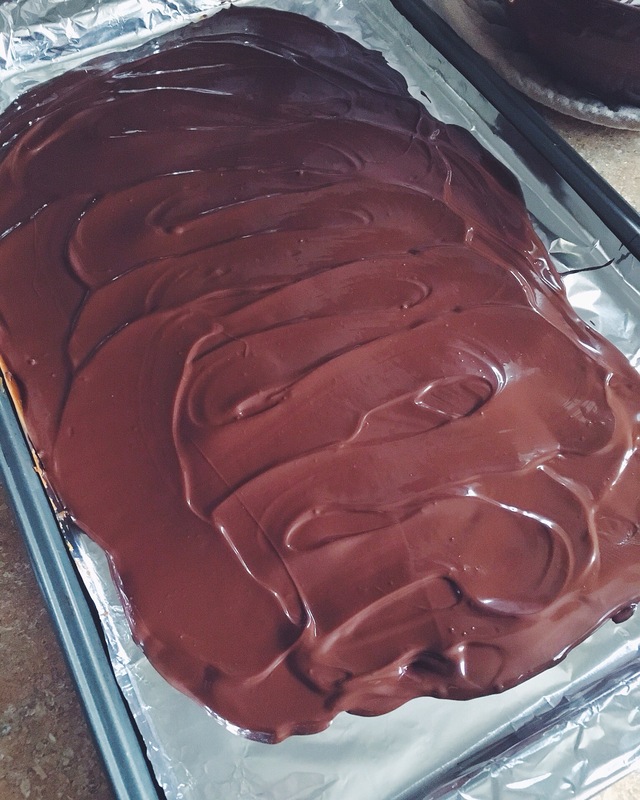 You’ll melt the chocolate in a double boiler or like me in a glass bowl over simmering water. Once the chocolate is all spread out, you’ll immediately sprinkle on the toppings and press down lightlty to make sure they stick into the chocolate. Once the brittle is finished and completely cooled you can break it with your hands into pieces, some bigger, some smaller, however you like it. 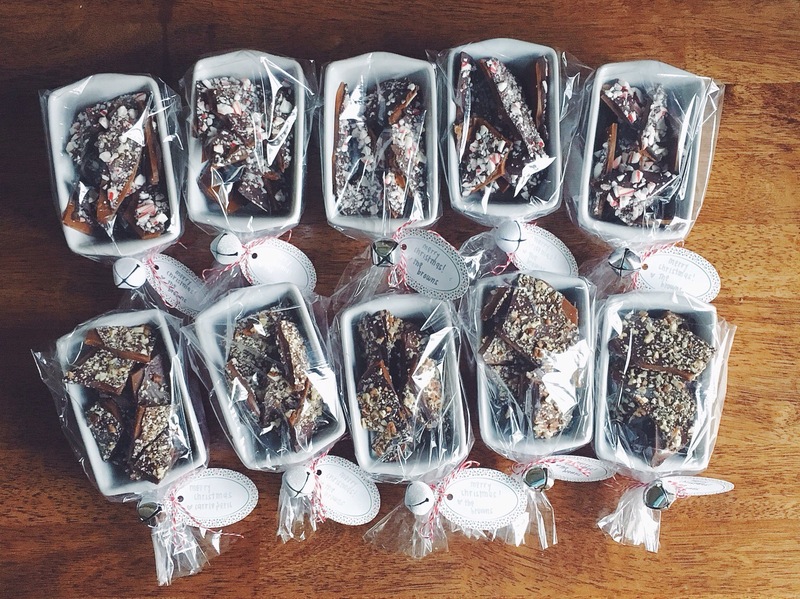 Then you can eat it all, or save some for others and wrap them up in cute little packages. 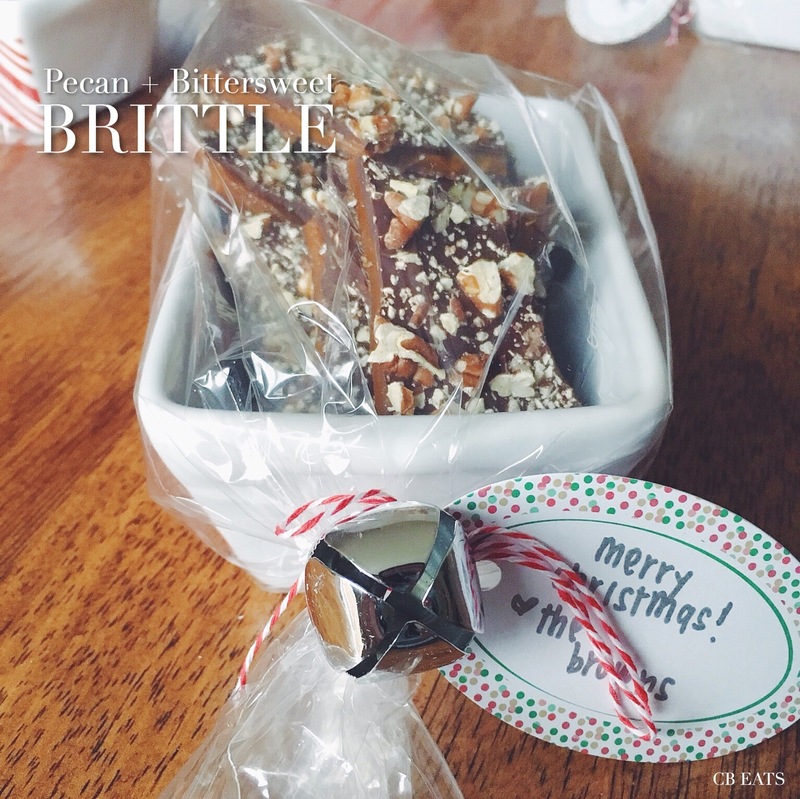 And voila, homemade brittle to share holiday cheer 🙂 The recipe below makes a single batch of 1 and 1/4 pounds of brittle, either Pecan or Peppermint. 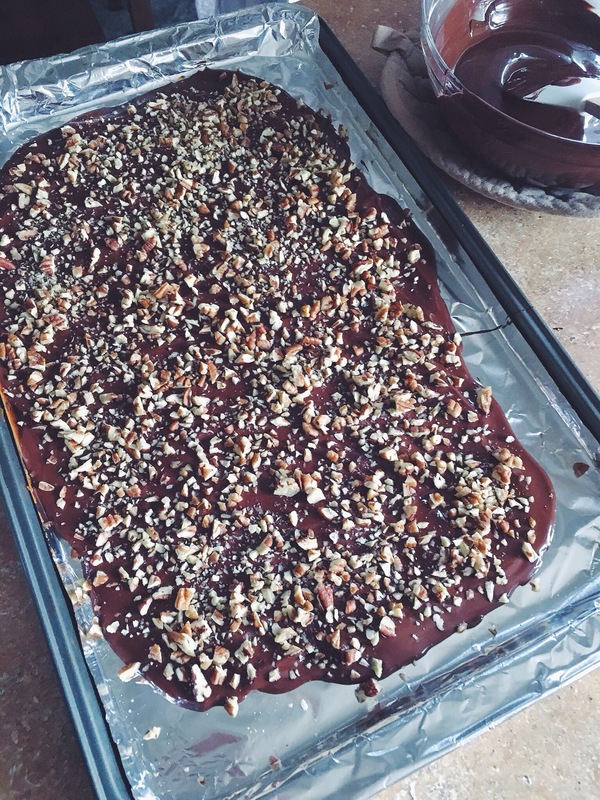 If you would like to make both you will need to double the Brittle recipe. 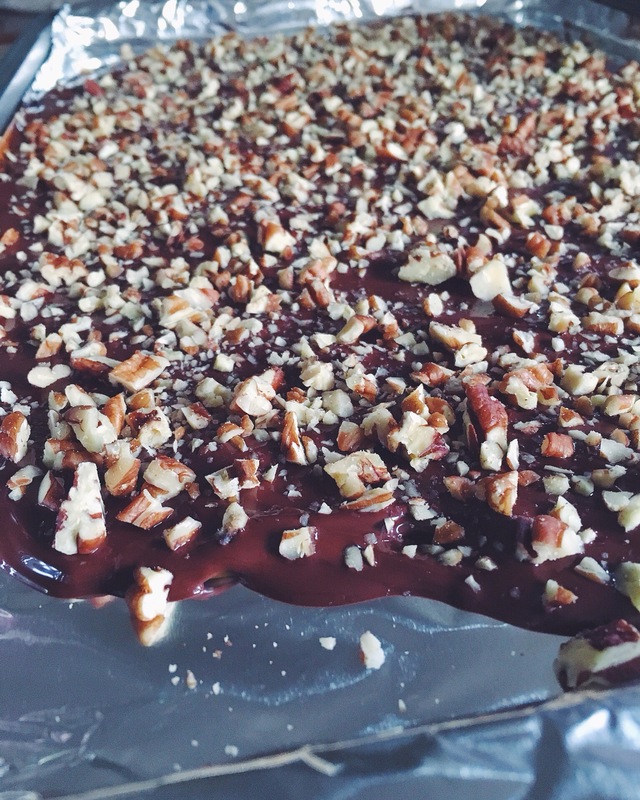 The amount of topping ingredients is enough to cover both sides of one batch of brittle, but you don’t have to cover both sides, just one side with toppings would be great too! Makes 1 & 1/4 lbs, or about 5 gift bags. 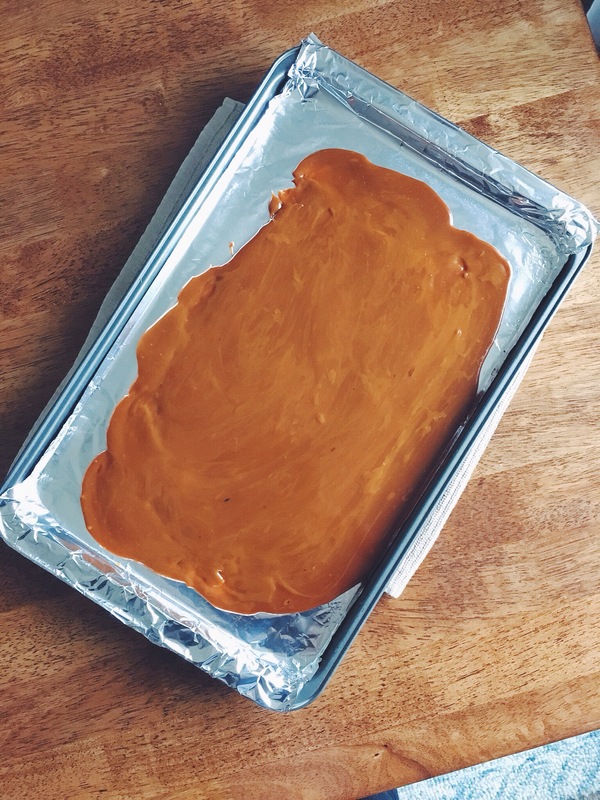 Cover baking sheet with heavy aluminum foil, set aside. In heavy medium size sauce pan, with candy thermometer inserted, cook butter, sugar, water, salt over medium heat until mixture reaches 305° F (hard crack), stirring occasionally. Watch closely once temperature reaches 200° F, the temperature will increase rapidly, begin stirring frequently when temp teaches 225° F. When mixture reaches 305° F, immediately remove pan from heat. Stir in vanilla. 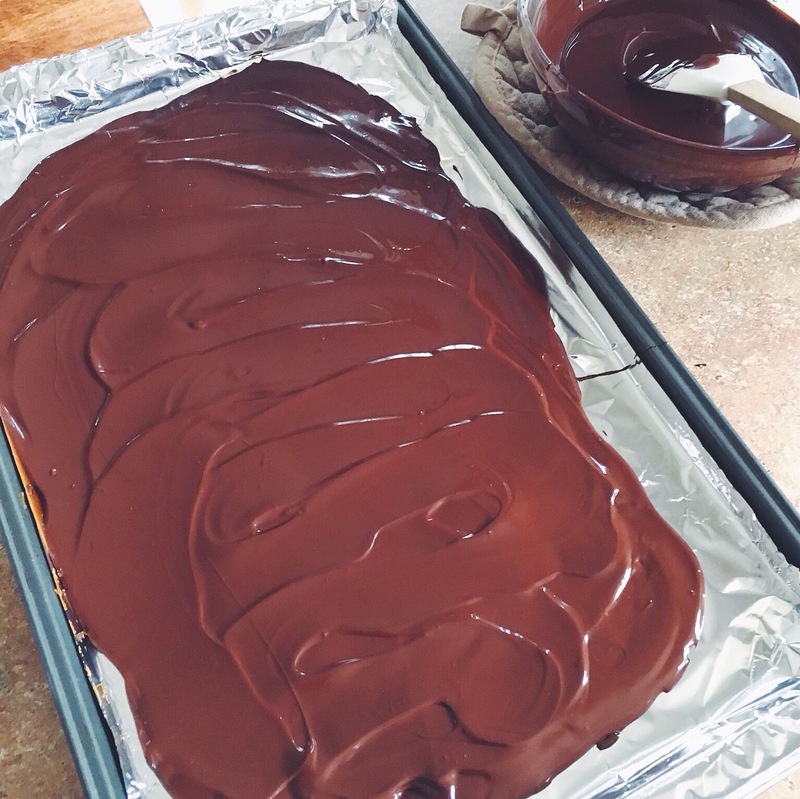 Pour mixture in the center of the foiled sheet, using a rubber spatula spread out quickly into a free form rectangle. Let cool until hard. 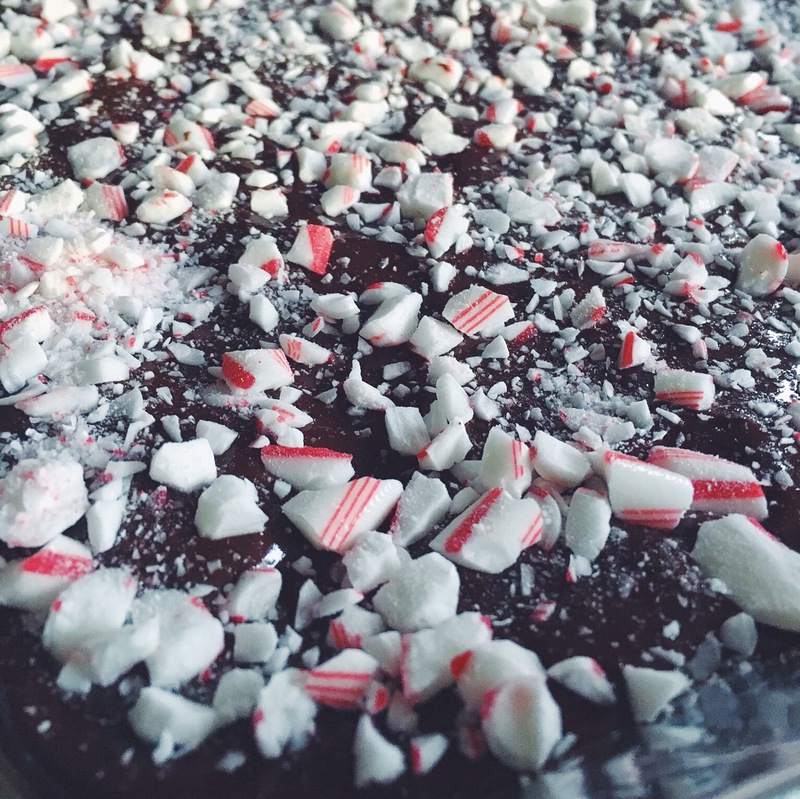 Follow the Pecan & Chocolate recipe or Peppermint & Chocolate recipe below for brittle topping. 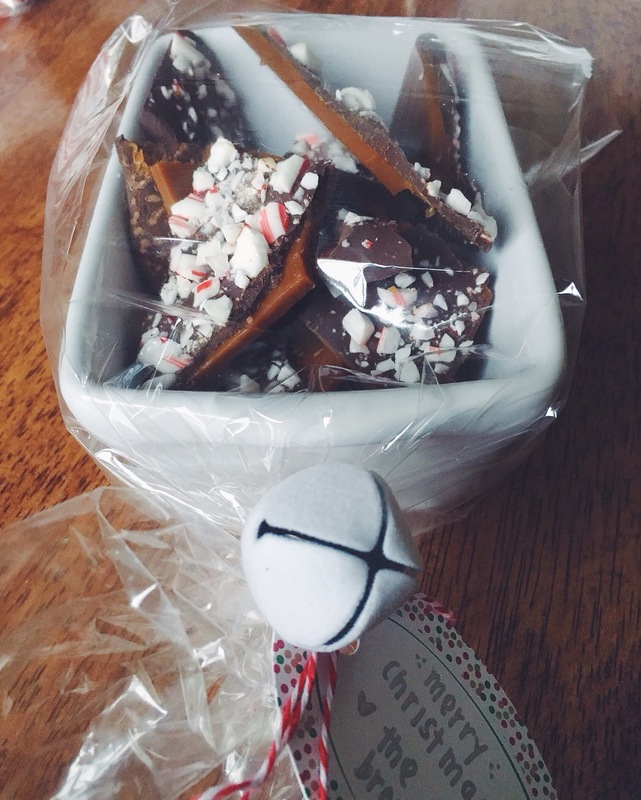 Melt the chocolate in a double boiler or glass bowl over simmering water. Stir occasionally until smooth. Spread immediately over cooled brittle and sprinkle with topping (nuts or candy), then press lightly with hand. Wait for chocolate side to dry completely, then flip toffee over carefully and repeat chocolate topping steps to cover the other side. Wait to dry completely and break into pieces. Store in airtight container for up to 1 month at room temperature.